Comfortable surroundings make us feel safe, relaxed and happy. 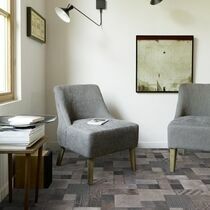 The Texline Comfort collection marries emerging interior design trends with opulent underfoot comfort. Thick, soft and warm this seamless roll range can be loose laid in any room of the home. The exclusive textile backing is water resistant so you can enjoy the latest colours and designs along with optimal comfort in your kitchen, bathroom and laundry. Texline Comfort is the MOST acoustically robust product in the entire Gerflor portfolio. These outstanding acoustic properties make it the ideal solution for townhouses, apartments and any multi-storey dwelling. Sustainable backing made from recycled plastic bottles. Inspired? Try our new tool Explore Gerflor!